The Mad answer to upping the game against springtime toms. 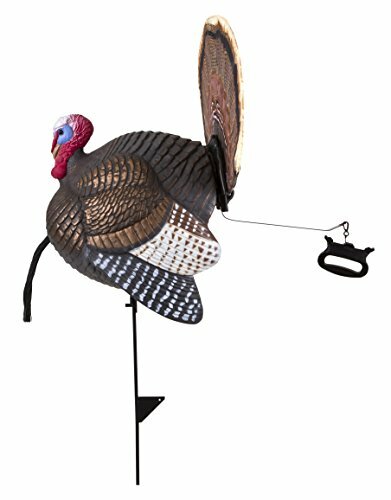 The simple, reliable pull-string operation of the spin-n-strut allows you to now entice a gobbler to come pick a fight with controlled decoy movement. Here's the perk: no electronics, no noise, and no batteries means all natural "tomfoolery". read and respond after a quick 30-second setup to the body Language of an approaching Longbeard with cam-actuated body rotation and a full range of fantail positions. Pull the string from your position in cover and the fantail slowly rises as the body simultaneously rotates. Release the tension and the decoy resets. It's one thing to grab the attention of a roaming gobbler with a hen call, but to seal the deal, the spin-n-strut motion ramps up the realism of the trap you're trying to set to a whole new level. The call brings them in close, the spin-n-strut coaxes them in for a final bout. The only difference between the spin-n-strut and the bird now in your sights is a heartbeat. If you have any questions about this product by Flambeau Outdoors, contact us by completing and submitting the form below. If you are looking for a specif part number, please include it with your message.